The products that you purchased from State Trustees contain legally valid forms. State Trustees has made every effort to ensure that the information provided in all of the kits are consistent with the laws at the time of issue; however these laws may change after the date of issue. The information provided below will help you to confirm that the kit purchased is the most current version. The State Trustees Legal Will Kit helps people with uncomplicated circumstances create a convenient and affordable will. Single pack contains one will form. This can be found on the back of your booklet above the barcode. 1703 or 1410, 1502, 1505– This can be found at the footer of the will form included in the Kit. IMPORTANT: If you have purchased this kit within the last six months and the version numbers on your kit do not match the numbers above then please call us on 9667 6444 to arrange an exchange (proof of purchase and return of the unused product will be required). Legal Will (single pack) is available to purchase online or you can buy a copy from major Australia Post stores or selected newsagency outlets in Victoria. The State Trustees Legal Will Kit helps people with uncomplicated circumstances create a convenient and affordable will. A double pack contains two will forms. 1703 or 1410, 1502, 1505– This can be found at the footer of the will forms included in the kit. 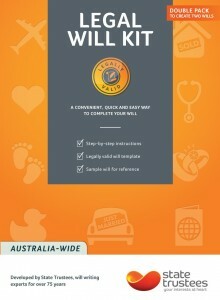 Legal Will is available to purchase online or you can buy a copy of the Double Kit from major Australia Post stores or selected newsagency outlets in Victoria. The State Trustees Legal POA kit helps you to legally appoint a trusted person to make decisions on your behalf. The State Trustees Power of Attorney kits help you to legally appoint a trusted person to make decisions on your behalf. 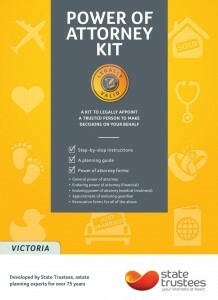 Legal Power of Attorney Kits are available to purchase online. * This number is found at the footer of each of the forms included in the kit. Which parts of the Kit are affected by the change? the appointment of a supportive attorney in respect of medical treatment decisions (except for the revocation of such appointments). Which parts of the Kit are not affected by the change? The form for revocation of a supportive attorney appointment will also not be affected by the change, even if the scope of the appointment extends to medical treatment decisions. If you purchased a State Trustees Victorian Power of Attorney kit from an Australia Post store or newsagency outlet in Victoria during the period 11 January 2018 to 12 March 2018 inclusive, and you are able to provide State Trustees with your proof of purchase. You can register to be notified when updated copies of the equivalent forms relating to medical treatment planning and decision making under the Act, together with explanatory background information becomes available. 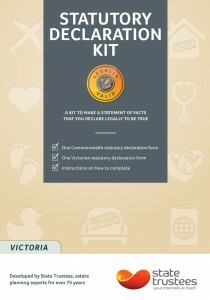 If you purchased a State Trustees Victorian Power of Attorney kit from the State Trustees Online Shop during the period 11 January 2018 to 12 March 2018 inclusive, State Trustees will email to you a free digital copy of the equivalent forms relating to medical treatment planning and decision making under the Act, together with explanatory background information. You will be able to use the new forms and information to make appointments or revocations relating to medical treatment decisions. The changes to the law commencing on 12 March 2018 the Powers of Attorney Act 2014 (Vic.) do not affect the validity of any appointment made using a State Trustees Victorian Power of Attorney kit, where the appointment document has been completed, signed and witnessed, and any appointment accepted, before 12 March 2018. The State Trustees Statutory Declaration kit helps you to declare something to be true. 1410, 1505 and 1610 – This can be found at the footer of each of the forms included in the kit.